Tired of catching frozen, hard discs that sting your hands? Give the Daredevil Frostie a try. It's made of a softer plastic that's suitable for colder weather conditions eh? It is also excellent for youth ultimate. Launched in February 2002, Daredevil Discs has become a well recognized ultimate disc in Canada and many locations around the world. Daredevil Discs is based in Ottawa, Ontario, Canada and is a 100% Canadian product. 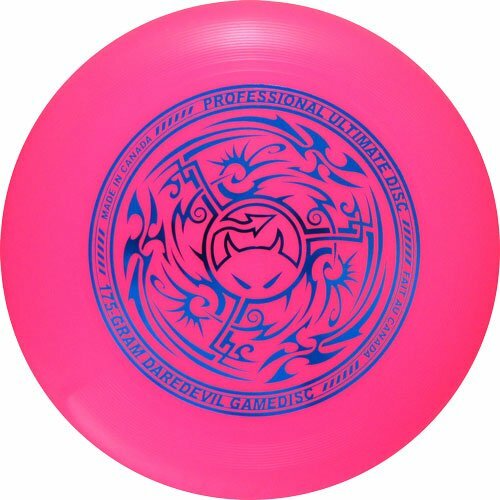 Daredevil Discs - The official maker of the 175g Ultimate "Gamedisc" and approved by the UPA (Ultimate Players' Association). If you have any questions about this product by Daredevil Ultimate Gamedisc - Pink, contact us by completing and submitting the form below. If you are looking for a specif part number, please include it with your message.